child on it could be pushed along instead. I hope for the day when our local market is too crowded for that to be feasible. The stroller is a Silver Cross Pop. It’s lightweight and works very well. For it’s minimalism, it still have a few features: There’s an area underneath the stroller to stow things, a pocket on the rear, the option to recline, and a sun shade. 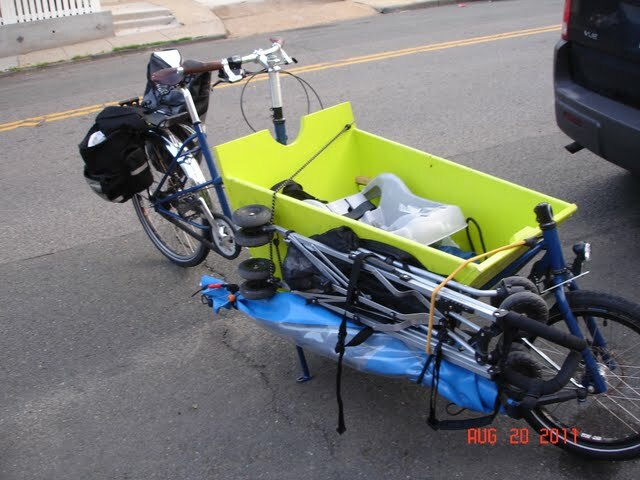 a Workcycles bakfiets for the same purpose. there’s a full sized Maclaren Stroller strapped to the other side. Next Next post: Transportation: All Options on the Table!